What came in the mail for the review. Though I am by no means on the level of many competition shooters, I have an understanding of the fundamentals of the sport. Speed and accuracy is really what it all boils down to. There are lots of gadgets that help with both aspects, some of which I have tried. I would imagine that there is debate on each aftermarket part as to whether it is viable or not. 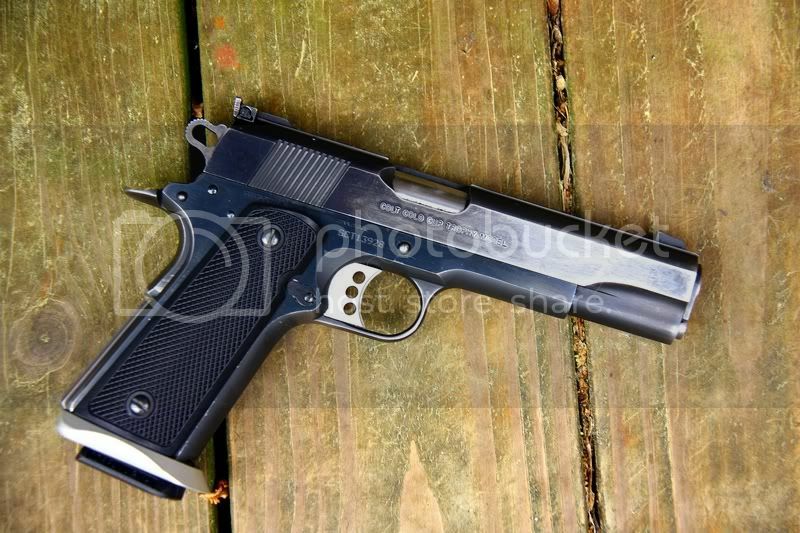 Be that as it may, there is little debate on the benefits of a large magazine well for a competition pistol. For those that are familiar with this, then, please bear with me – as I am going to explain my take on a magazine well. 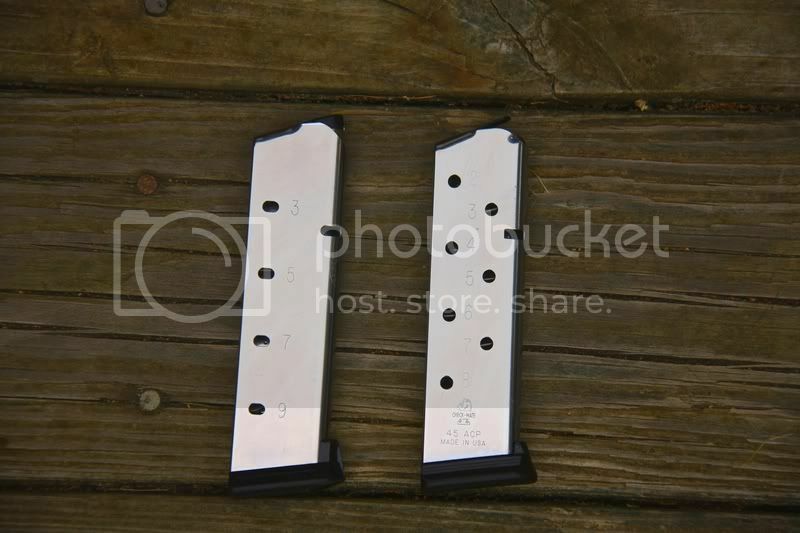 One area where time can be made up in a match is magazine changes, and especially shooting “Single Stack” where the greatest number of magazine changes must be made. The more time you devote to a magazine change, more time you have on the clock. 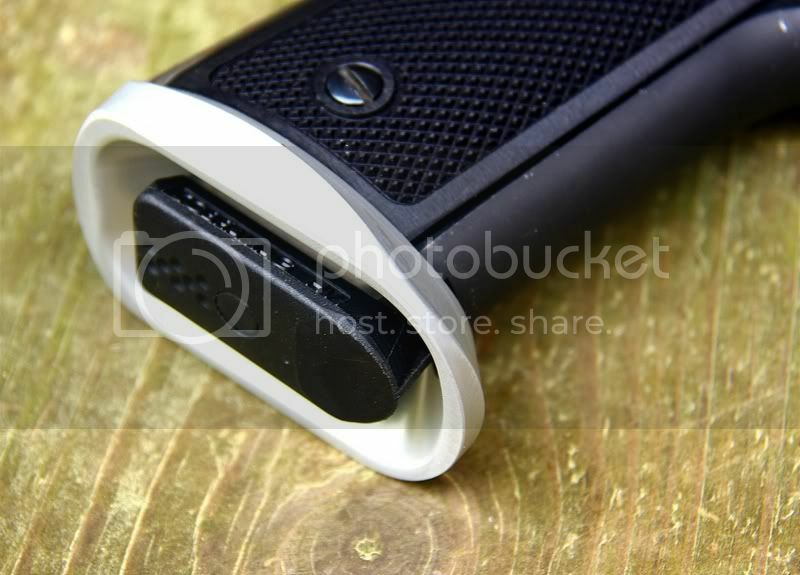 By adding a funnel (for lack of a better term) to the magazine well of the receiver of your pistol, you increase the target area for the fresh magazine. I have spent a lot of time practicing magazine changes and I have become fairly competent in finding the narrow magazine opening of my pistol frame, but not every time is a textbook mag change (actually, more times than not it is not textbook form). 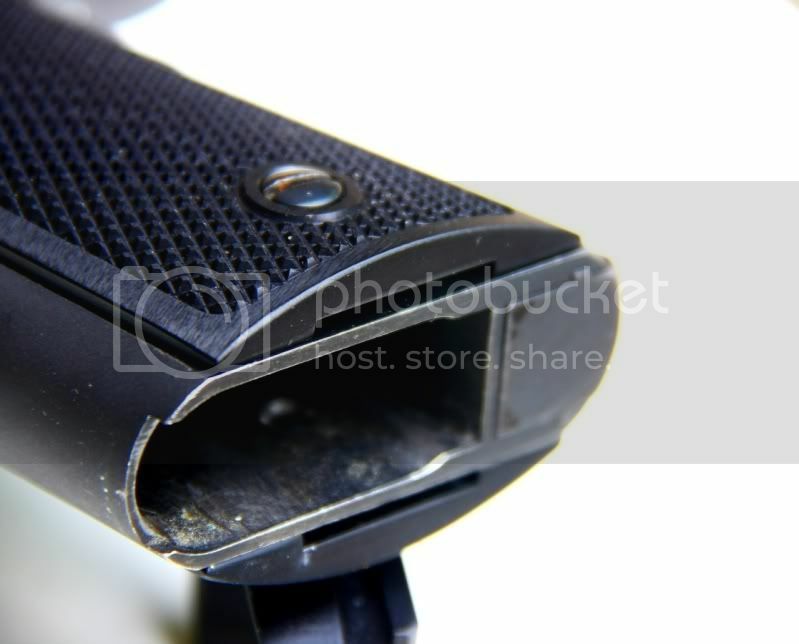 By adding a funnel (aka magwell) to the magazine opening and increasing the target area, you increase your chances for the fresh magazine to find mark. There are plenty of aftermarket magazine well options, but the open questions are: How well do they work, and how easily are they installed? 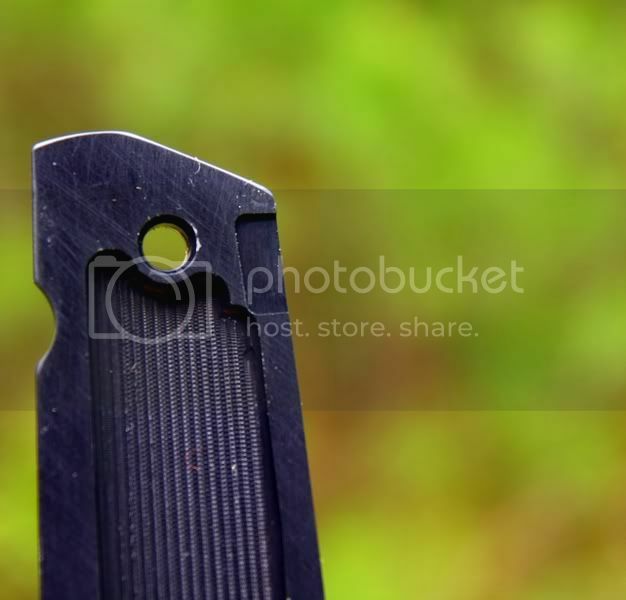 Many folks shoot matches with the same pistol they carry. A large magazine well is ideal for competition; however, it is less than ideal for the times you are using your pistol for concealed carry. Well, Bob Novak, an accomplished competitive shooter, put some thought into this as far as the Government Model is concerned and came up with something so simple it will make you ask yourself, “Why didn’t I think of that?” The TechwellUSA System is available in three interchangeable sizes, and it installs as quickly as you can turn the four stock screws. The TechWell USA System is held in place by the stocks, which have a void machined in the inside bottom to accept the lugs of the TechWell. When the stocks are installed, the lugs of the extended magazine well fill the void and the extended magazine well is held securely. Once you snug down the stock screws, the extended magazine well is well secured and I could find no vertical or horizontal play. One could easily drive to a match with one's pistol concealed using the “Carry” model and, upon arriving, swap to one of the two competition models for the match (SP for Standard base Pad, or XT for “XTended" base pad on magazine—see explanation below), and back again before leaving the range. Each of these swaps would take about two minutes. 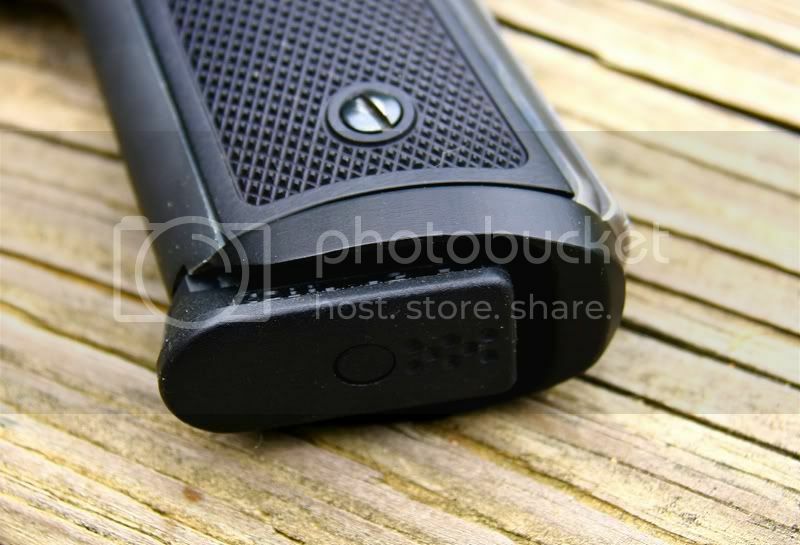 One drawback to any magazine well extension is that it adds length to the bottom of the magazine well. 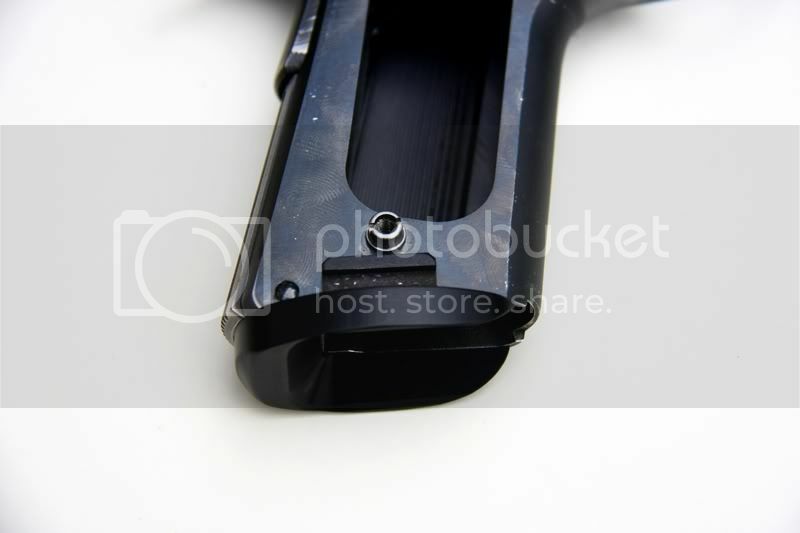 With standard magazines fitting flush to the receiver without the magazine well extension, they would be recessed in the extended magazine well. This would make reliable seating difficult. Now, as many of us have seen, many magazines come with base pads. 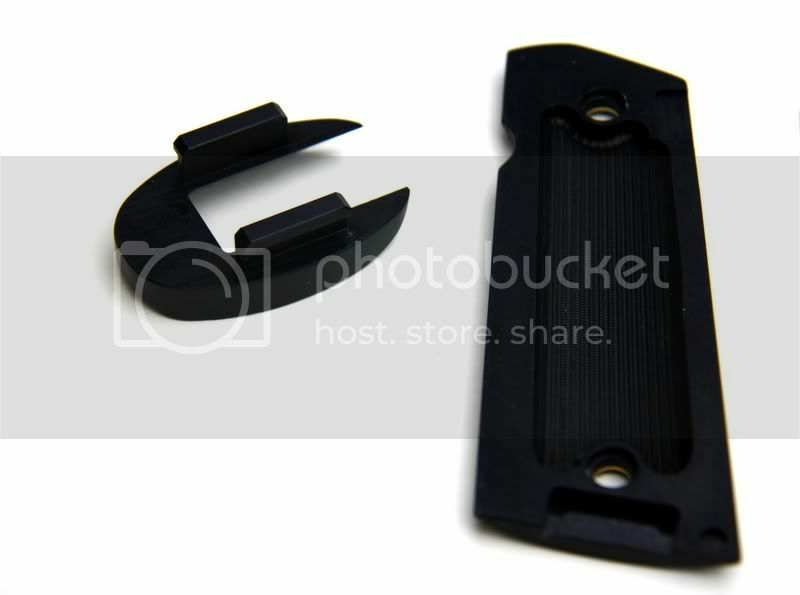 These base pads (or “slam pads,” as I have heard them called) add the length necessary for reliable magazine seating. Not all magazines are created equal. 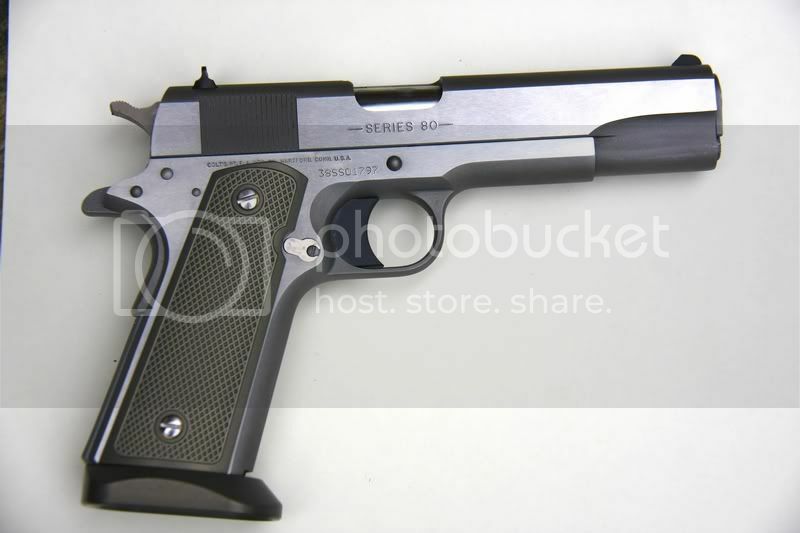 With that in mind Bob spoke with Virgil Tripp, owner of Tripp Research, about a special magazine for the TechWellUSA System, named by himself, appropriately, the Cobra “System” Magazine, an eight-round stainless steel magazine with the Tripp removable base pad. The CobraMag worked flawlessly with the TechWellUSA System. 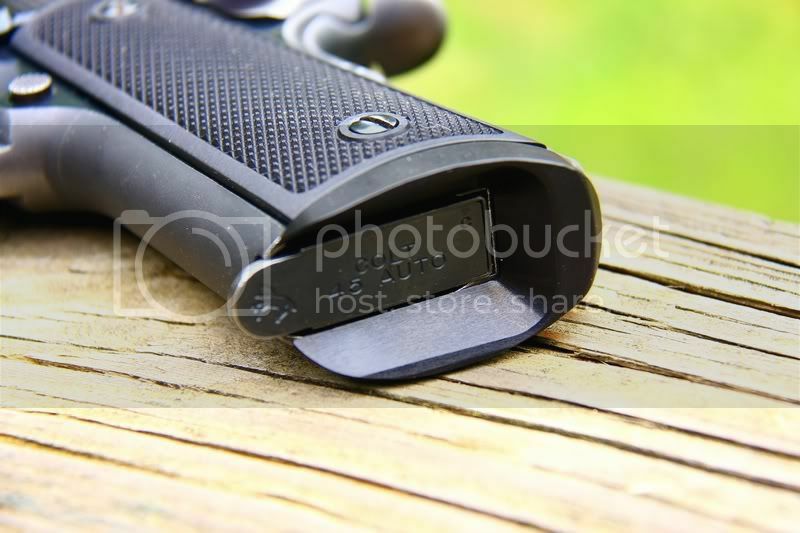 As a matter of fact, 1911Tuner (a member of the M1911.ORG Internet forum) and I talked about the CobraMag line of magazines and we actually tried some prior to my knowledge of theTechWellUSA. The ones we tried functioned as they should. With that said, I believed there were other magazines that would work as well. Jackie Vieweg from Check-Mate Industries sent me a couple of the new Check-Mate 8-round, stainless steel magazines with hybrid lips and base pads. 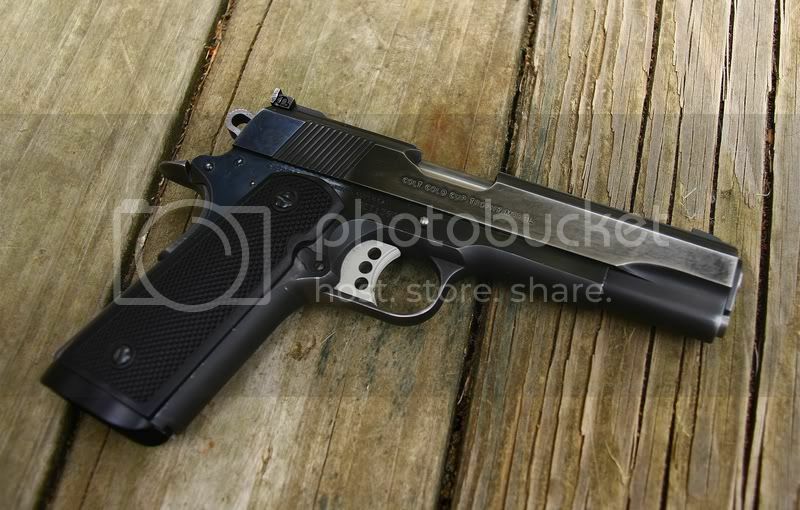 I am also a fan of Check-Mate magazines because of 1911Tuner. He is the one who turned me onto Jackie and Check-Mate. These Check-Mate magazines also worked flawlessly with the TechWell system. 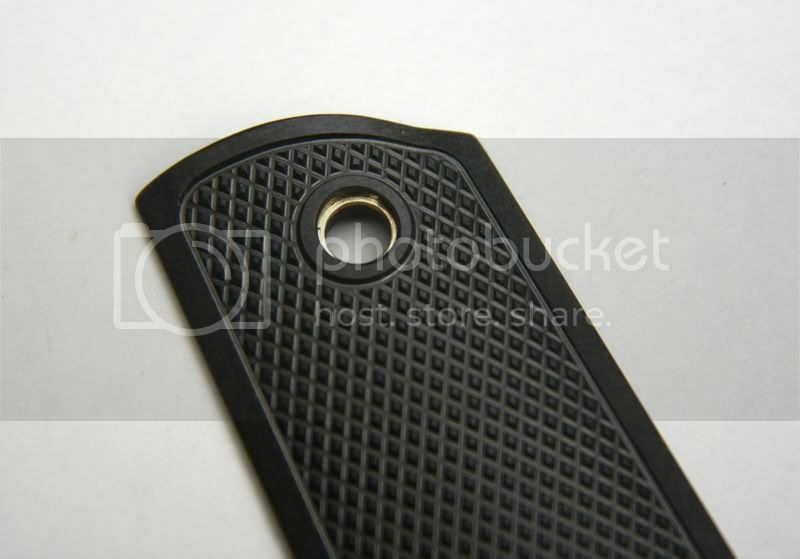 The base pad on the Check-Mate fit perfect as well with the TechWell system. The Tripp and Checkmate magazines. 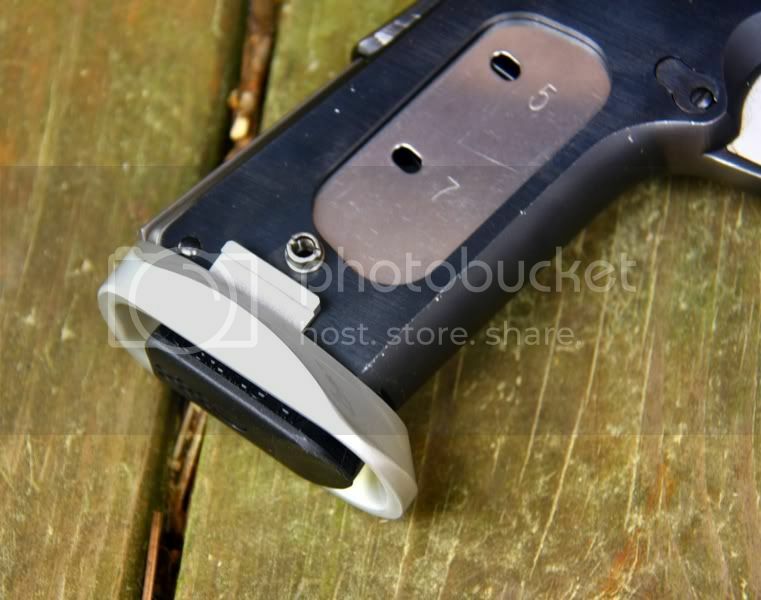 I also have a Chip McCormick ten-round extended magazine that I tried and it also worked with no problems. The Alumigrips have a brass insert for the stock screw. The bottom of the receiver with the stocks installed. 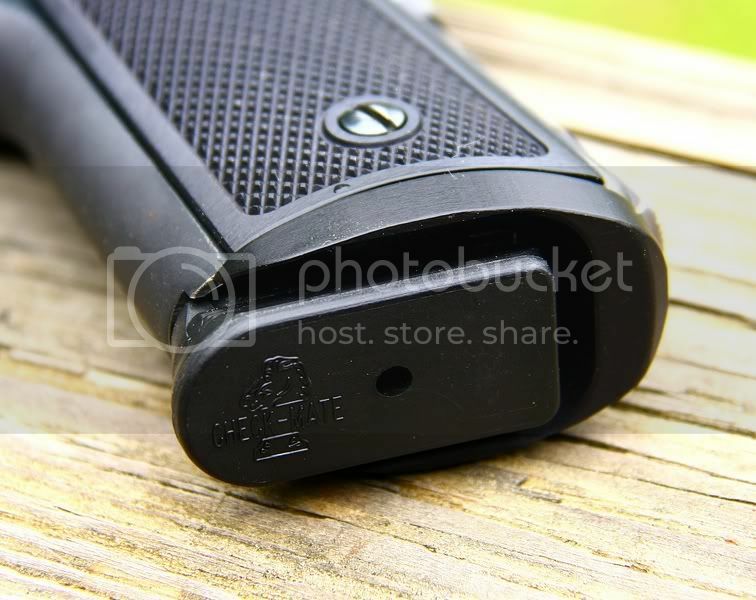 I want to point out the TechWell USA System does nothing to jeopardize reliability or function of your pistol but, as I said above, with the extended magazine well having a base pad on your magazine is a good idea for reliable magazine seating during a reload. 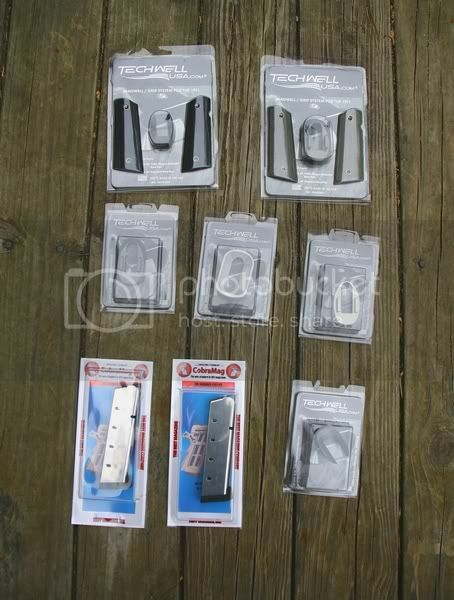 The TechWell USA System has been used by such shooters as Rob Leatham, and has already been featured in the Front Sight competition magazine (July 2008), Guns and Ammo Magazine (August 2008), Shooting USA’s “Sighting In” edition (October 15, 2008), and more. The TechWell USA System is available at www.techwellusa.com, where they stock the three TechWell models and the specially “slotted” AlumaGrips designed to hold them in place in Black, Silver, and Olive/Gray. At no extra charge, but with an additional month of order time, an additional seven colors are available: Bordeaux, Fire Red, Green Gray, Gold, Turquoise, Violet, and Light Blue. All are machined from T-6 aircraft aluminum. The TechWell USA System has a patent pending. 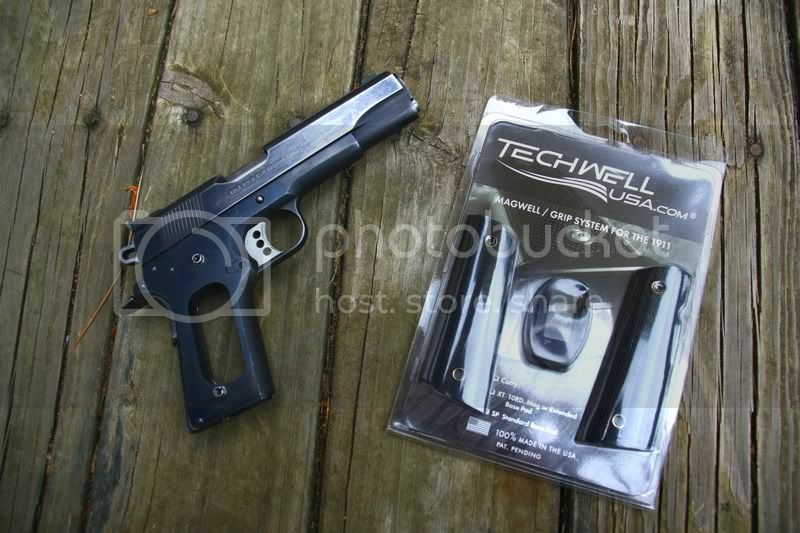 It is also worth mentioning that the TechWell is made 100&#37; in the USA. The TechWell System is designed to be compatible with all 1911 pistols and clones using Mr. John Moses Browning’s design specs. 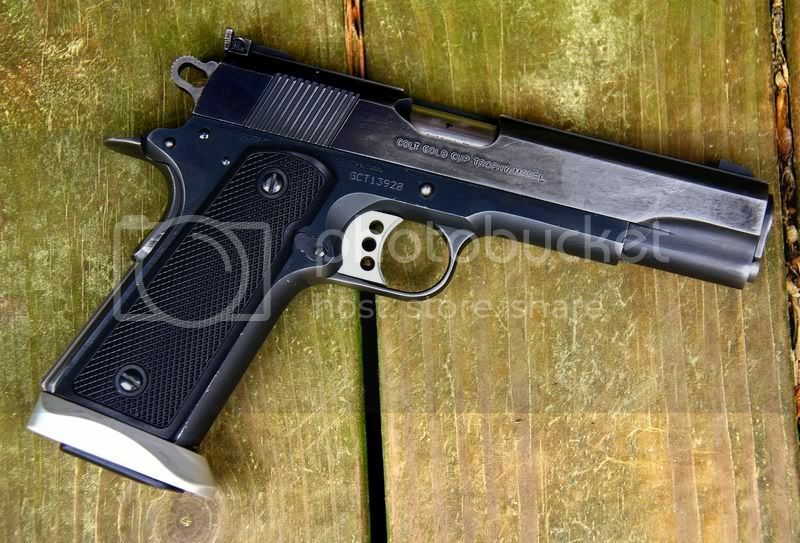 However, some manufacturers fabricate their pistols with minor changes to those dimensions, so the TechWell USA System was designed to be “tuned” to accommodate these fluctuations. To that end, though installation is pretty straightforward, the TechWell USA.com web site has a detailed short video on how to install the TechWell System, and an additional one if “tuning” it proves necessary (which is truly rare). The TechWell USA system is $149.99. (That includes the magazine well extender and stocks). 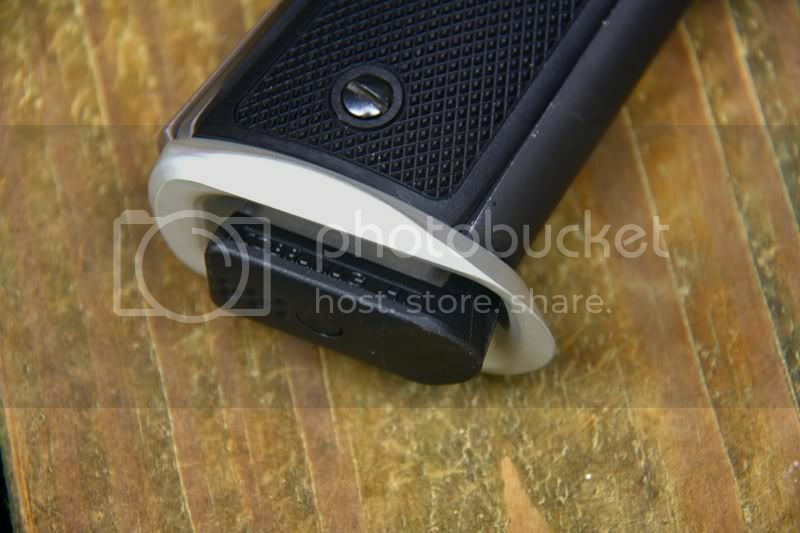 The extended magazine well is interchangeable it is sold separately for $85. 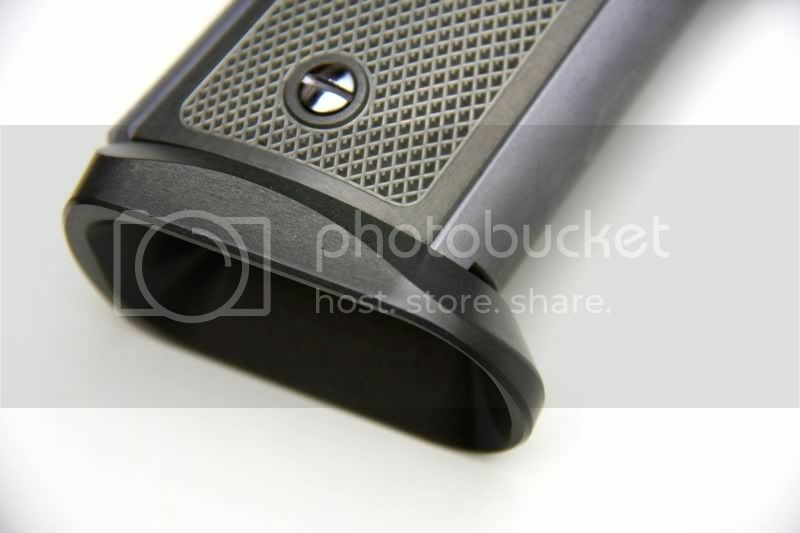 The stocks machined for the extended magazine well are $75.50. Bob Novak for the chance to review his TechWell USA System, and his help throughout the review. Virgil Tripp with Tripp research. Please follow this link to discuss or ask questions about the TechWellUSA review.